What do Amish think about other religions? Amish do not evangelize. 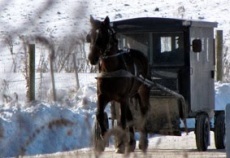 Amish society is in many ways closed to outsiders. Amish only marry other Amish. Based on these ideas, one might assume that Amish consider the Amish brand of Christianity to be the only, or most preferable path to salvation. Yet Amish can be quite accepting of other religions, and many have an enlightened view of other faiths. Amish tend not to criticize other religions. While they may be skeptical of some that are not Christian—for example, Islam—Amish often express respect for other brands of Christianity and even for non-Christian faiths such as Judaism. One reason for this is the idea that criticizing other religious paths and presuming that theirs is superior would mean to presume to know God’s will. This would be seen as highly prideful and assumptive by the Amish. Amish also tend to instinctively respect bodies that teach values of peace and brotherly love. One Amishman, for example, expressed respect for the Jewish faith, despite doctrinal differences between Judaism and Christianity. Along the same lines, Amish would find it unhumble and presumptive to assume that the Amish path is the only and best path to heaven. Amish themselves cannot be sure about their own salvation, and most Amish express a “living hope” rather than believing in assurance of salvation. Amish typically see such approaches as presumptuous. Certain Amish groups, in particular the New Order Amish, do espouse an assurance viewpoint, however. Amish tend to have a particular affinity for members of other Plain denominations such as Old Order Mennonites, River Brethren, and Hutterites. These churches share similar beliefs and interpretations of Biblical doctrine. Plain churches also share cultural values such as humility, community, and modesty, though the particular expression of those values may differ somewhat. Plain dress, and use of similar or identical Germanic language in some cases also provide a bond between these groups. Amish cooperate with Old Order Mennonites in Lancaster County, for example, on schooling and in other areas. Certain publications, such as Die Botschaft in Pennsylvania, The Budget in Ohio, and the nationally-distributed Family Life magazine feature Plain contributors and have a large reader base across Plain society, including among Mennonites. Amish and even some higher Mennonites cooperate as well, in particular in charity and mission work. Amish often contribute financial donations and labor to causes such as disaster relief (ie , after Hurricane Katrina), coordinated through Mennonite-run bodies such as Mennonite Central Committee (MCC) and Mennonite Disaster Relief (MDS). There may be, however, some concern that exposure to “higher” churches may entice some to leave the Amish. Some of these churches seek converts from the Amish, such as the Charity Christian Fellowship, a Pennsylvania-based church that has claimed many Amish and former Amish. Individuals leaving the Amish church may end up in Mennonite and other Anabaptist-umbrella churches that espouse similar principles theologically, but often allow a higher degree of technology. Some Amish may be attracted to a more charismatic, experiential, and individualized approach to faith which stands in sharp contrast to the Old Order approach, and thus a contingent of Amish leaving the Old Order also gravitate to churches with this orientation. How do Amish feel about their children joining other churches? Typically Amish wish to keep their own children within the Amish faith and believe that the Amish way is the best way for those born Amish. However they typically also accept their children’s decision when choosing not to be Amish in favor of another church. The desire to keep children within the Amish faith is often for fear of what the Amish refer to as “backsliding”—gradually accepting more and more lenient social and religious practices, and more closely assimilating with “the world”. Conflict over backsliding has appeared on numerous occasions through Amish history and has led to church division. Amish tend to take a long view—conscious that decisions made today can affect generations down the line. An Amish minister expressed this well when he said he had no problem with other Christian denominations—Mennonites, Baptists, Catholics—but felt he should stay Amish, if only for his children’s sake. Setting a strong and rigid example today means it is less likely that one’s descendants will find social behaviors taboo to the Amish, such as divorce or homosexuality, acceptable. It makes it more likely that one’s children and grandchildren will take Christian precepts to heart and live them out in day to day life. In any case, most of those children do choose the Amish path, with 80-90% or more choosing to be baptized. Having grown up within the culture, being highly exposed to Amish values, and appreciating the social and familial support networks that membership entails, baptism in the Amish faith is often the natural choice for Amish youth. 21 responses to What do Amish think about other religions? I have recently moved to Berne, Indiana. Reading this website has educated me about the Amish. As a newcomer to the community, what is the correct way to acknowledge a person of this community. I walk daily and pass individuals from this community on the sidewalks frequently. Is it correct to speak and say good morning? I have found that most Amish are not outgoing, but that doesn’t mean they are not friendly. They do enjoy conversations, and I’ve enjoyed good exchanges, even or maybe, especially, about faith. I’m also surprised how many wave from their buggies at me as I drive by them-I would think they get tired of waving, not all do, but some wave & I appreciate that. Enjoy your walks in a unique environment! Sure thing Patricia, glad you found the site. And on saying hello, feel free to. Like any other folks Amish appreciate friendly greetings. This website is very helpful! (: I was just wondering on how their beliefs differ from Chritans/ Lutherans.I tried to do some research, but can’t seem to find a straight answer.. Thank you! it would be a great help! To Sara – I found a free Kindle book on Amazon (A History of American Christianity [Kindle Edition] by Leonard Woolsey Bacon) that covers the fascinating history of the Pre-Revolution German migration to America (along with all other denominations). The Germans came in 3 groups: Amish/Mennonite, Lutheran, and Moravian. Pre-Revolution they all worshipped together because of the small communities and/or shared buildings and few ministers. Then the Lutherans wanted their own ordinations and worship services. As to the differences you were wondering about, all Protestants have the same basic beliefs on salvation, God, Jesus, etc., but the differences in the denominations really come through the services of communion and baptism, and that is where Amish and Lutherans really differ. You will find Amish beliefs to be basically the same as in any Protestant church, both correct and incorrect. Since the Amish church leadership controls the service, the biblical knowledge (or lack of same) is very dependent on that. Like all Protestants, the ultimate responsibility is upon the individual to study the Bible, but since their Bible is in German, not many can read it. They depend on the same English translations we all study. So, basically, they are the same as any Protestant Christian today. What does Amish (or Anabaptist rather) theology say in regard to the soul of a person who has died prior to baptism? Does a “lost” soul mean hell or is it something else? I also understand most Amish, as stated on your website, do not believe baptism is assurance of salvation. But, again, is baptism a pre-requisite for salvation? I’ve been trying to find answers, but have not been successful. Any assistance would be very welcome. Amish believe salvation comes by works and also believe baptism is part of salvation, so if a person dies before baptism and baptism is part of works than they do not go to heaven, I think? That would be most logical right? The problem is, with all religions not based on the authority of Gods word, there must be exception upon exception to cover mans fallible interpretation of Gods word. 7 That being justified by his grace, we should be made heirs according to the hope of eternal life”. I do realize you are just looking into the Amish religion but please don’t forget the word of God. There are Amish that do believe that their works will saved them, maybe even too many of them. But not all do that. Some do believe that they are or will be saved by grace by faith. But they also believe in reading the rest of the context of Eph 2, continue reading the 10th verse. We are saved onto good works. Not onto complacency, or just to get to heaven. We are saved to obey while we are here on earth and to get to heaven afterwards. Support for the position is also found in James 2(most of the chapter) and a very important verse in a Christians life: John 14:15 If ye love me, keep my commandments. One can continue to read John 14 through verse 24 to learn that loving God means following his Word. What part of His Word? 2Ti 3:16 All scripture [is] given by inspiration of God, and [is] profitable for doctrine, for reproof, for correction, for instruction in righteousness:2Ti 3:17 That the man of God may be perfect, throughly furnished unto all good works. The point is that one cannot separate faith from good works. Good works being the commands of God throughout the entire Bible. Some things are cancel by later scripture, that is why we do not observe the Jewish ceremonies. But under no circumstances are we saved to ignore God and His Word, remaining conformed to the world. Indeed, when we are given a saving faith, we love God’s Word in a way that compels us to obedience to that Word. This is the difference between just Orthodoxy alone and Orthodoxy and Orthopraxy together. I see both as required for a complete faith in the God of the Bible. Thank you for your comment Lance. I am from mid-Michigan area. The Amish in our area believe they are saved by Grace but must keep good works to continue to be saved, which is what I think you are talking about. This is not consistent with Gods word. I believe James 2 lines up and compliments Ephesians 2. Verse 10 of Ephesians does not change the context of the chapter, saved by Grace. Verse 10 states The God of The Bible is in control, His creation,(saved by Grace) through Christ produces good works. Faith and works as stated in James are inseparable Graces and are the result of the saving Grace in Ephesians. One without the other is not Grace. If you have Faith and no works you were never saved by Grace , if you have works and no faith you were never saved by Grace. I actually believe that they believe God will sort who is saved and that the best they can do is to try and show their love for him through their works. This is why I love and respect the Amish so much. Unlike some people, they mind their own business and they do not try to shove their beliefs upon others. They may not agree with one’s beliefs at times, but they respect people enough to not shove what they believe in others faces. Like homosexuality? Even though they may not believe in it, they do not go around with signs saying homosexuals are going to Hell. I respect these people sooooo much. how do you find an amish church near you? i live in ks and would like some amish friends my age i am 28 leave comments at my address BethanyAnne22@gmail.com. thanks i am at a lost… at how to correspond to them! Maybe you could point out just what is “inaccurate”? Or, you might elaborate why it is impossible for non-Amish to understand “their true belief and way of life”. Otherwise, not sure what this adds. I said MOST of it. I could take up this whole space to say what is inaccurate & tell you what Amish life really is but I am not going to do that. I’ll make a couple points here. One, you don’t sound like a “former Amish” to me; frankly I don’t believe you know much at all about Amish life. The article is generally pretty accurate. Two, your attitude is also pretty uncharitable for a “former Amish”; if you are too lazy or uncaring to correct what you perceive as someone’s error, then you have no business complaining about it. Forest, you took the words out of my mind before I had a chance to read your comment, but having read your comment, I agree with you. I also reread the article. I am a member in an Old Amish church and I am in agreement with what was written. Oh sure, it won’t apply to every community, group or person, but like you said, it is generally pretty accurate. Hi EriK, I want to say first how much I admire what you’ve done through the years with this website (I’ve been reading it for ten years or more) – it’s truly a beautiful labor of love on your part. I was interested in what you said about so many not being able to read the Bible in German. I was – I don’t know why – under the impression that their schooling provides literacy in primarily German and then English. Why would they not be able to read it? Is the language very archaic, perhaps – kind of comparable to what an English speaker might find with the King James Bible? Nice article – it is in keeping with what my Old Order Amish friends have told me they believe. Could you do me a favor and point me to which passage on the Bible in German ? I’m not seeing it in this post and wondering if maybe you are referencing a different post or comment or I’m just missing it. I would say that Amish have more fluency with Pennsylvania German over High German because they use that every day, but they do get schooling in High German and read the Bible in that language (though ability might vary in different groups). When I am in Amish homes the Martin Luther German Bible is used for reading and High German prayer is given, and it is also used in church. I can’t comment on how archaic the High German is as the linguistic question is not my forte but think it is just a comfort level based on how often each language is used. In any case glad to hear the gist of this article fits with what you have heard from your OOA friends. Leave a reply to What do Amish think about other religions?